The history of the Aberdeen Hotel, one of the oldest hotels in Perth, takes in three different buildings that were eventually amalgamated. These were being the original (central) two storey building that was built as a hotel in c1884 and originally called the All Nations Hotel; a two storey house and shop that was built on the west side of the hotel in 1892 called Balcony House, and the set of three shops/houses called St Johns Buildings that was built next door on the east side in 1897. The Aberdeen Hotel has also had many name changes: All Nations Hotel, Cosmopolitan Hotel, Union Hotel, Red Lion Inn/Hotel, then Aberdeen Hotel, later shortened to the Deen. In 1884, part of the land that the Aberdeen Hotel now sits on was acquired by William Love who built a house and stables, later converting the house to a hotel which was then sub-let or rented to Messrs Jones and Company, Brewers. In 1886 the first licence for the hotel was issued to Peter Bensberg who called it the “All Nations Hotel”. In 1891, the new licencee, Netterville Routledge Davies carried out renovations and improvements to the hotel, which he now called the Cosmopolitan. By December 1895, the Cosmopolitan Hotel was leased by Charles Corpaccioli and his wife, Ada. However, the Corpacciolis only ran the hotel for a short time, but were still an important part of the story of the hotel as they constructed the set of shops with dwellings next door, on the east side, called St Johns Building in 1897. In 1905, the hotel was taken over by the Schruth family who owned the adjoining house, called the Balcony House, which had been built in 1892. The Schruths changed the name to the Union Hotel. In 1922, significant alterations were made to the hotel which included incorporating the Schruths’ two storey Balcony House into the hotel then completely rebuilding the facade drastically changing the appearance of the hotel from its original domestic appearance to a much more commanding hotel building with its masonry arched colonnades to the ground and first floor and decorative roof parapet. The Schruths sold the hotel in 1926, and in 1939 the hotel was renamed the Red Lion Inn (later altered to Red Lion Hotel) a name that would become synonymous with the hotel in later years. The 1980s signified one of the most important periods in the hotel’s social history. The licence was taken over by Peter Arrons who went on to establish the Red Lion Hotel as an important meeting place for Perth’s Gay, Lesbian, Bisexual and Transexual (GLBT) community for reviews, cabaret and ‘drag’ acts which also became popular with the broader community. Arrons also transformed the front of the hotel into a coffee shop, bar and restaurant called “Pinkles”. In 1989, the hotel was extensively refurbished and re-opened as the “Aberdeen Hotel”. However, although the Red Lion days were no longer, the hotel started a weekly institution whereby for one night of the week it ran “Red Lion at the Aberdeen” which would transform the hotel into a welcome space for the GLBT community to gather. The last major changes occurred in 1996 when the back section of the hotel was resumed by Main Roads Department for the construction of the Northbridge Tunnel, and the St Johns Building to the east were incorporated into the hotel complex as compensation for the loss of the back portion of the Lot. 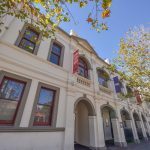 The history of the Aberdeen Hotel, one of the oldest hotels in Perth, takes in three different buildings that were eventually amalgamated. These were being the original (central) two storey building that was built as a hotel in c1884 and originally called the All Nations Hotel; a two storey house and shop that was built on the west side of the hotel in 1892 called Balcony House, and the set of three shops/houses called St Johns Buildings that was built next door on the east side in 1897. In 1884, part of the land that the Aberdeen Hotel now sits on was acquired by the publican, William Love. At the time, this portion of Aberdeen Street was called Lamb Street. Love built a house on this land in 1884, but in the rate books for 1886 a two storey hotel and stables was recorded as now being on Love’s property. This was sub-let or rented by Love to Messrs Jones and Company, Brewers. In 1886 the first licence for the hotel, which had 10 bedrooms and 4 sitting rooms, was issued to Peter Bensberg who was renting it from the Messrs Jones. It was Bensberg who called the hotel the “All Nations Hotel”. However, Bensberg only ran the hotel for just over a year, and from 1887 the licence was taken over by Jones until 1891. After Jones, the hotel was then leased to Netterville Routledge Davies. In 1891, Davies advertised his intentions to acquire a publican’s general licence for the house on Lamb Street, that he rented from William Love and to keep it as an inn or public house. Davies also stated his intention to change the name of the hotel from the All Nations Hotel to the Cosmopolitan Hotel. This was the name of the hotel Davies had previously operated when he was in Townsville. At the time of this advertisement, the hotel was described as containing 3 sitting rooms and 9 bedrooms as well as private quarters where Davies and his family lived. An advertisement of Davies’ hotel which appeared just after he started trading mentions the renovations and improvements Davies was carrying out to the building. In 1892, a large two storey residence was built abutting the Cosmopolitan Hotel on the west side and called “Balcony House”. The shop mainly operated as a bakery. Davies didn’t live to see out his ten year lease as he died in 1895. By December 1895, the Cosmopolitan Hotel was then leased by Carlino (Charles) Corpaccioli and his wife, Ada. Corpaccioli, also known as “Copper Charlie”, was already a well-known champion Western Australian bowler. Although they only held the licence for the hotel for a year, the Corpacciolis undertook further renovations and improvements throughout and promoted its excellent cuisine, high class beverages and superior accommodation. They also included in all their advertisements that the hotel was conveniently located 5 minutes from the train and the post office. Curiously, previous advertisements said that the hotel was 2 minutes’ walks to the train station or sometimes 3 minutes so it obviously depended on how fast one walked! Despite only running the hotel for a short time, the Corpacciolis were still an important part of the story of the hotel as they constructed the set of shops with dwellings next door to the hotel, to the east, which was called St Johns Building. Charlie Corpaccioli advertised tenders for builders in March 1897 for the three two storey shops in Lamb Street, then followed separate tenders for plastering and for painting, with the shops and rooms advertised for rent by July 1897. By 1901, the lessee for the Cosmopolitan Hotel was Stanley Brewing Company, which also carried out alterations and additions including a new bar front and changes to the upstairs hotel rooms. By this time, the street had been renamed Aberdeen Street as part of a wholesale change of street names across Perth by the Perth City Council in 1897. In 1905, the hotel was being managed by Willie Schruth whose father, Friedrich, had bought the adjoining Balcony House and who ran the Beaufort Arms Hotel and also the Royal Hotel. The Schruths, who eventually purchased the hotel, changed the name to the Union Hotel, the name it retained until 1939. In 1905 the Schruths added a skittle (or bowling) alley built by Thomas Bartlett, and made other extensions designed by architect, William Wolf who had achieved some local prominence having designed the newly built His Majesty’s Theatre in Hay Street. The hotel stayed in the ownership of the Schruth family for many years and was managed by various members of the family. Many changes were made to the hotel by the Schruths, particularly by Heinrich (Harry) Schruth who took over the licence in 1917. In 1922, Harry engaged architect P. W. Harrison to prepare plans for alterations to the hotel. These works, completed in 1923, drastically changed the appearance and size of the hotel from its original domestic appearance to a much more commanding hotel building and to what the hotel look like today. The alterations included incorporating the Schruths’ two storey Balcony House on the west side into the hotel. The front of the hotel was also extended forward with the original double storey timber verandah replaced with masonry arched colonnades or loggias to the ground and first floor and capped by a decorative parapet concealing the roof behind. The Schruths sold the hotel toward the end of 1926 to Mrs B Thomas. The longest serving licensee for the Union Hotel from this time was Frederick Carter, from 1927 to 1932. Smartly modernised and fitted with the latest comfort features, the Red Lion Inn in Aberdeen Street, Perth, is the re-named and renovated Union Hotel. 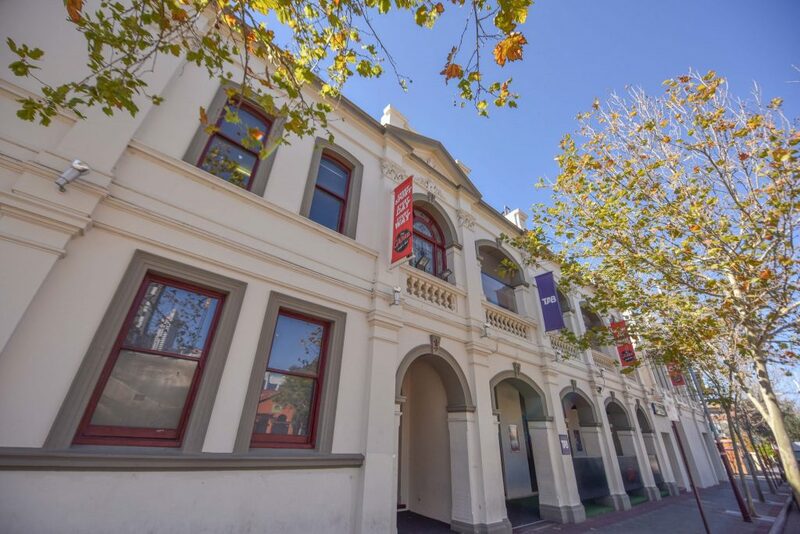 One of the oldest hotels in Perth north of the railway line, it is now equipped on the most modern lines and able to offer a high standard of comfort and service to its patrons and guests. …Its cream cement-rendered front is striking and effective. Central ornamentations on the facade are the two rampant lions in red which give their, name to the structure. Next door to the hotel, at the St Johns Building, from 1920 to 1923 Father Germanos Illiou operated his Pittakos Greek night school. The Macedonian community then used St John’s Building as a community clubhouse from 1940 until at least 1949. In 1961, a complete remodelling of the saloon and public bars was carried out with this part of the hotel called the “New Australian” bar. The 1980s signified one of the most important periods in the hotel’s social history. The licence was taken over by Peter Arrons who went on to establish the Red Lion Hotel as an important meeting place for Perth’s Gay, Lesbian, Bisexual and Transexual (GLBT) community. A stage area was set up in the back section of the hotel behind the main bar where reviews, cabaret and ‘drag’ acts were performed, and which were watched not just by members of the GLBT but became popular with the broader community. Arrons also transformed the front room of the hotel into a coffee shop, bar and restaurant called “Pinkles”. In 1985, a below ground swimming pool was installed in the grounds. In 1989, extensive alterations were carried out including the removal of the upstairs bedrooms, complete remodelling of the ground floor bar area and the outside bar area was converted into a garden pavilion bar. With its new look, the hotel re-opened as the “Aberdeen Hotel”. However, although the Red Lion days were no longer, in the late 1990s the hotel started a weekly institution whereby for one night of the week it ran “Red Lion at the Aberdeen” which would transform the hotel into a welcome space for the GLBT community to gather. In 1996 the back section of the hotel was resumed by Main Roads Department as part of the construction of the Northbridge Tunnel. The St Johns Building to the east were incorporated into the hotel complex as compensation for the loss of the back portion of the Lot. The ownership of the hotel was completely transferred to the Commissioner for Main Roads in 1998 which leased it back to operate as a hotel which now trades under the name “The Deen”.